I think the first seeds we got were the fifth generation, but don't quote me on that. This was a growing project started by Craig Ruggless of Winnetka Farms, a small farm in the San Fernando Valley which forms the Northern Edge of a good deal of Los Angeles. The project had very easy parameters – very clear and observable. 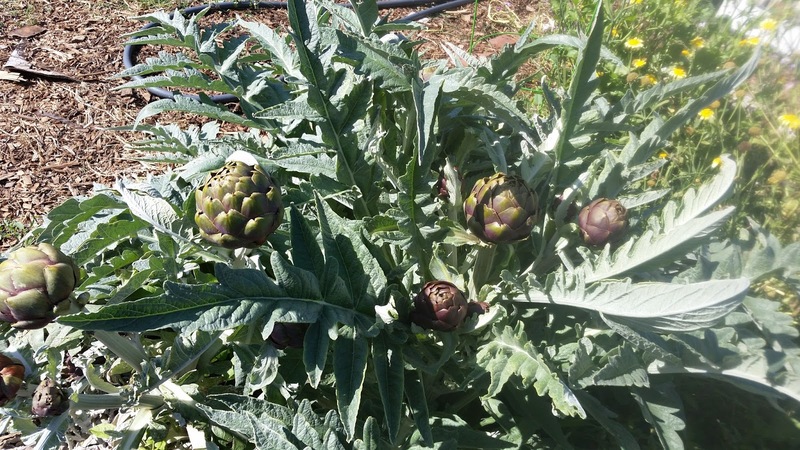 Think of the very best of the commercial artichokes – hold a picture of that choke in your mind. You will see a very large choke with tightly wrapped bracts and the tips of those bracts are not pointy without any spines of much note. Certainly none to fear. If you have had the purple artichokes available in the markets, the difference is astonishing. Purple chokes have chokes that are 50% or so smaller than the green chokes, the bracts are pointy and possess a dangerous little needle on the tip of each bract and not enough purple to obfuscate the blood effusing from your wounded fingers. Craig's brilliant idea was to get a purple choke with the same civilized attributes as the green choke. Then, life being what life is, he bought a farm in Vermont which I am led to understand is not a prime site for growing artichokes of any color. SLOLA was bequeathed a quantity of seed and some drying chokes so we could see what the “ideal” Winnetka Purple Artichoke should look like. And with the easily seen goal and perimeters the continued work with these chokes certainly was the perfect project for a fledgling seed library: Good for the chokes and a great teaching tool for the library. Like I said, it was about the 5th generation that was bequeathed to us. In breeding parlance it would be known as “F5” - “F” standing for “filial. 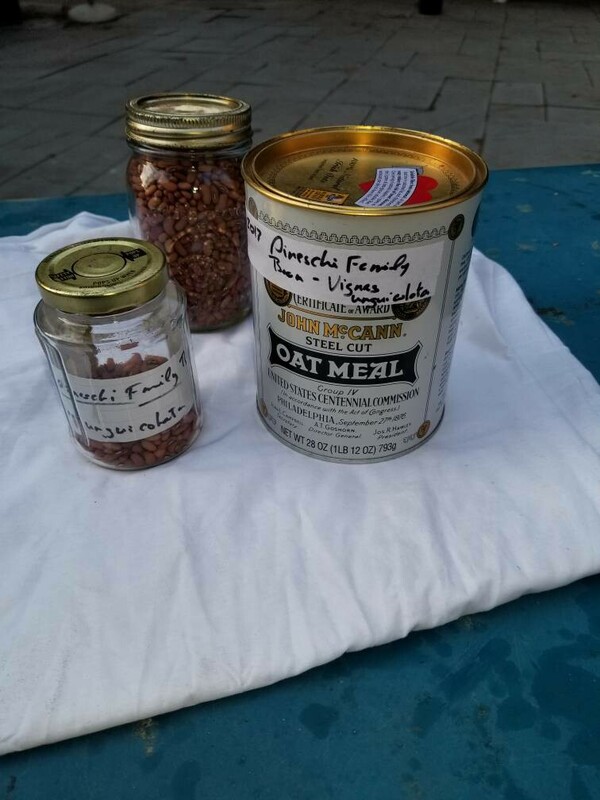 Many people took seed, but the only ones I know that were returned to be a part of the seed library came from members Joy Sun and Julie Mann. And each had a distinctive population with characteristics different from each other. The Sun group plants were HUGE. We are talking 8 foot plants and the chokes were enormous. They had the correct shape and the pointy ends were not blood letters. They had one drawback in my mind: They weren't very purple. On the other hand, the Mann group were normal sized plants. The chokes were a good size but not Green Goliath size, they seemed to adapt to civilization with aplomb and not eager to draw blood. 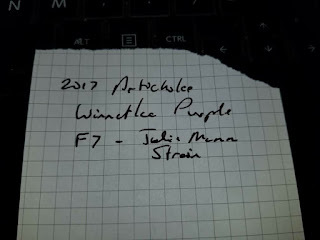 I have four chokes from the Mann Strain – I have started seeds of F7 - another generation having been grown between then and now - and intend to grow them out at the Learning Garden – which is where the Sun strain is growing. These population sizes are of some concern to me as we might create a bottle neck if we don't grow larger numbers, but I think we move immediately to larger populations, we can avoid that. Getting the seed from the dried artichoke is straight forward, if messy. The tufts at the top are the remains of the artichoke flower. The seeds are dried together and break away like one would break away small bits from a very thin cork. 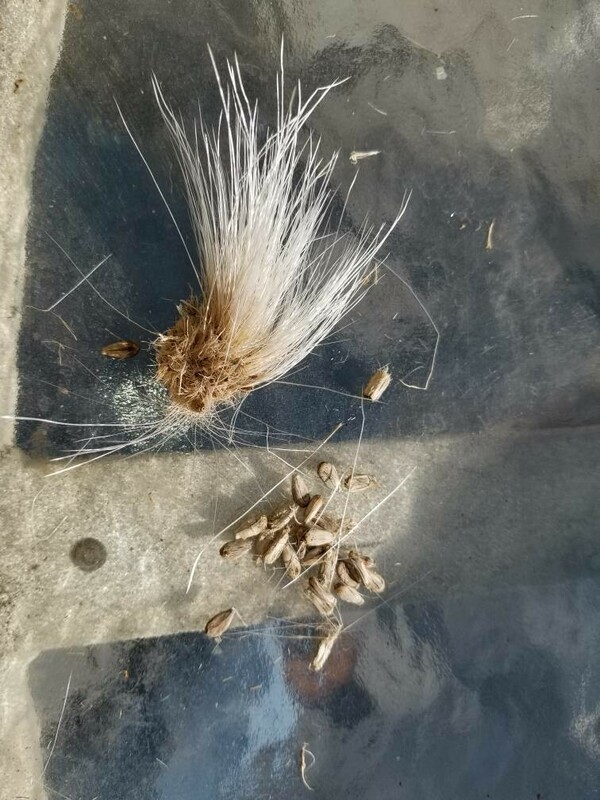 The size of the choke itself compared to the seeds. I have kept some chokes intact and dismembered others for seed. The most important thing is to keep the seeds away from predation! Overnight that can ruin the whole process and - afterall, one cannot go to the store and buy a replacement packet of seeds! Packing the seeds I did not plant for safe keeping involves proper labeling! This label is put inside the jar with the seeds with the same information on the label on the outside of the jar. All too often something happens to the outside label and then what would one do? Just like eggs, do not put all your seeds in one basket. In a future report, I hope I can show you some results and keep you posted on the progress. A seed library is a library that deals in living material. We bend and shape the future based on the decisions we make in the field about what to save and how we will save it. Will I decide to cross my Mann strain with the Sun strain? Or will I try to keep the two strains separate? Will I do a little of both? Stay tuned! I haven't yet decided! N.B. This post will be updated with more photos of the different strains and better comparisons between the two. Also with each new filial generation, new assumptions and decisions will be made. Follow the drama of plant selection with me! Against the Grain, A Deep History of The Earliest States, published in 2017, provides a very different look at the first organized states in human history than we have considered to be the reality of human civilization. The author, James C. Scott, makes no pretense to being an authority in this particular territory, but does bring a scientific mind and a patient attitude in his poking around with accepted theory about humans and their evolving attempts at civilization. This work was a real eye-opener for me explaining some historical phenomena that I hadn't realized needed explanation. Like, why did millions of America's First Nation people die with the arrival of the Europeans and their diseases? Yes, we know what happened, but what is the backstory? Modern doctrine holds that, as humans evolved, they left the nomadic life behind and took up crops grown in tended fields. The bias in most science today is that, in the hierarchy of civilization, hunter/gatherers were a rung lower than farmers with their crops; that humans came to be farmers as they climbed the path of being "more civilized" rather than less - that living in cities was such a big improvement and people flocked to the cities to find protection from the barbarians raiding through out the "uncivilized" parts of the world. Maybe that isn't the way it happened, says Scott. So, with the nature of a scientist, he turns the theories up side down and asks, "is this not more likely?" Using this contrarian lens, forces us to re-evaluate these theories, so universally accepted; and comes up with different thoughts and explanations. 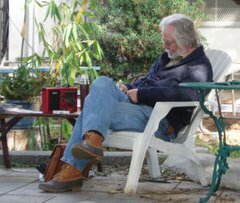 It won't change the way I garden, but it does make me rethink the idea of being "civilized" and the particular baggage we carry by being "civilized." Is this the true culmination of civilized or are we simply in transition? This is not a large book and can be read in a weekend or two, but I guarantee, once read, you cannot easily squash your thinking back into the old paradigms we have long assumed to be the basis of our civilizations today. Your mind cannot be unstretched. And that's a very good thing. jar is mine to plant! Seeds are abundant! There are seeds and seed stories everywhere. Everyone has a relationship to seeds whether they own it or not, because the history of humans and human civilizations are intertwined so deeply, over so many hundreds of years, has made it so. Today's industrial agriculture obfuscates that which once was an intimate relationship into a commodity that we buy, sell, grown with poison and produced with the cheapest means to get to market. But seed savers everywhere, want to hold the seed and know the story behind the seed – how did it come to be here? 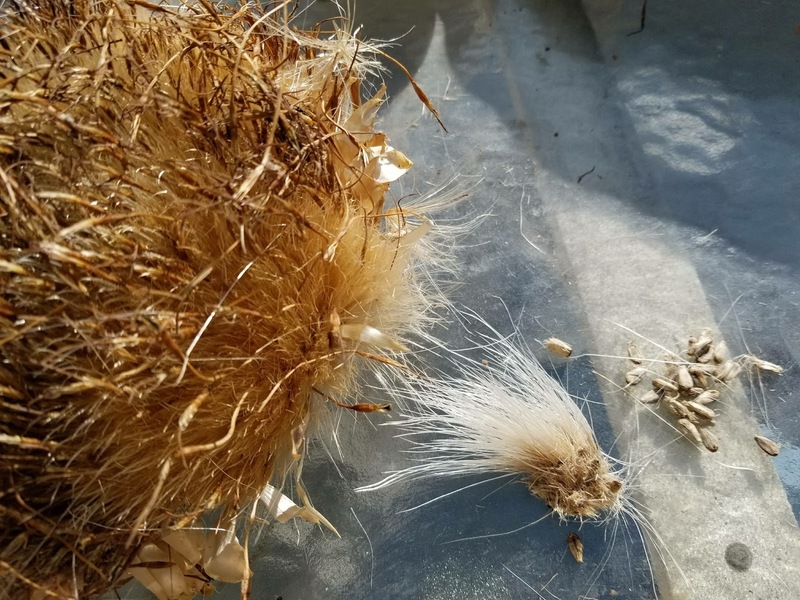 And it is the story that makes heirloom seeds “Heirlooms.” There are many old seeds – seeds of varieties that have been around for 100 years or more – but they aren't “heirlooms” without a story. 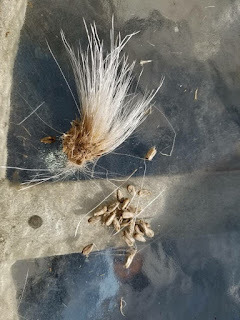 This is about a seed with a story. I don't know how old this variety is, but the story is good enough for the seed to be called an heirloom and the story seems to point to the fact that it is indeed an heirloom. It's starts out with a dental appointment. My dental hygienist is married to a dentist. She sees me three or four times a year, if I'm lucky, he sees me three or four times a decade. Professionally at least. So this was one of those professional encounters where I get the question “are you numb yet?” I'm slow about getting numb. He has some stuff in my mouth and my hygienist drops by to say hi, and says to her husband, “David has started a seed library to save old seeds...” And the dentist gets very excited! It turns out that his grandmother (great-grandmother?) had given him some seeds when he had graduated dental school and was moving to Los Angeles to set up his practice. He was charged with these bean seeds as they were the family bean. He had them for over fifteen years and was not so successful in growing enough to keep the seeds supply healthy and he asked if I would help keep his family bean alive. Of course I would! That's what being a seed savior is all about! Within a week, I was given an envelope of about 55 seeds of a bean. They were small seeds and I was told they were old. I planted all that I had and presently had a crop of four plants – not a lot of beans. Once the plants were growing and the leaves were distinct, I realized this was not a common bean – Phaseolus vulgaris. And the beans themselves were too long as well. A little research and I figured I had Vigna unguiculata, a close relative, and edible, but not the common bean. It took more time to figure out how to pronounce “unguiculata” than it did to find the correct binomial for it. This species is called 'cowpea' probably because they were used for forage for animals as well as human consumption. Cultivated cowpeas are known by the common names black-eyed pea, southern pea, yardlong bean, and crowder pea. Fairly common – and their ability to grow in sandy soil makes them a desirable species to have in our storage. They were domesticated in Africa and are one of the oldest crops to be farmed and not an American bean – like Phaseolus vulgaris, which is what one might suspect without digging into the history of beans. A second domestication event probably occurred in Asia, before they spread into Europe and the Americas. Our 'cowpea' came from Italy and we call it the Pineschi Family Bean in deference to Dr. Pineschi and his wife that brought this bean to my attention. You can check this productive bean out from the Seed Library when we restock our summer seeds in March. It is a vigorous climber and a good producer of 10 to 12 inch long slender pods. Pick young pods, in the 10 to 12 range and just steam them. I, of course, add butter. Delicious!